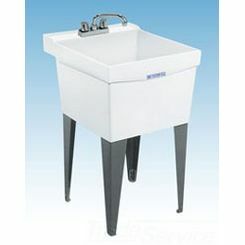 Mustee 63M Mop Sink - 24" x 24"
PlumbersStock offers a variety of quality wholesale sinks for your home, but we also carry a collection of utility room sinks. 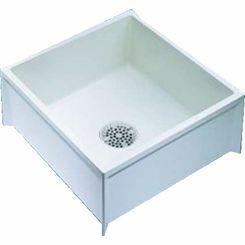 Also known as laundry sinks, they come in many different shapes and sizes each with its own style and purpose. 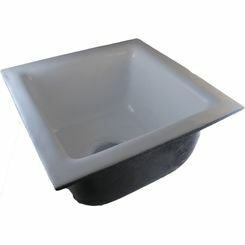 We carry wall sinks, floor sinks and of course the vanity styled variety. They are constructed from many different materials, including cast iron, fiberglass, and stainless steel. One of our most popular designs is the copolymer, fiberglass poly granite mixture for its seemingly unmatched durability. 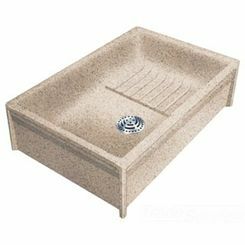 Contact us if you have any trouble locating the best sink, sink parts, or the right laundry faucet or threaded utility faucet to go with it. A utility unit can be helpful to have in a home in a number of ways. Most of the time homeowners place a utility sink in the garage, laundry room, a workshop, or in a mudroom, so you don't track mud or dirt into the house. This is especially convenient for homes in rural areas, cabins, or for families with a lot of active children. Maybe most commonly homeowners put them to use as a laundry sink. This is very convenient for those who have a laundry room adjacent to the garage. Some people have small mudrooms usually near the front or back door. 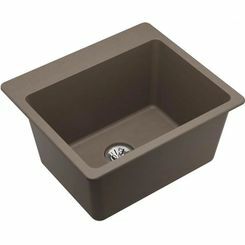 This is where the utility sink is typically installed. 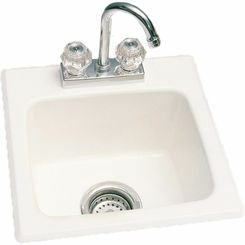 Consider the intended purpose for your sink to ensure you purchase a unit with a basin that meets your needs. Some homeowners use it for cleaning the family pet. 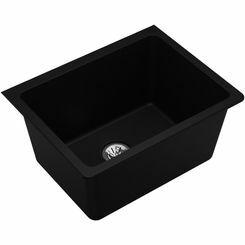 There are 1001 different ways to put a utility sink to use. 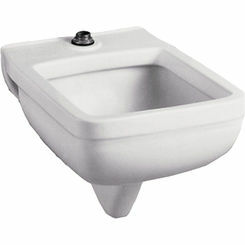 We carry a unit called the Mop Service sink. 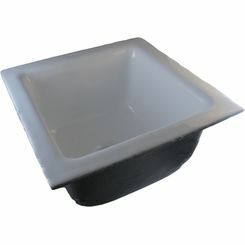 This type of utility room sink sits at ground level and will come in handy when you are washing your floors. 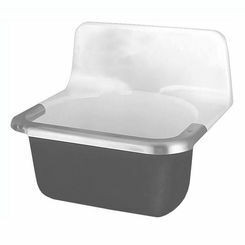 It eliminates the need to carry a bucket full of soapy water around the house. Many wonder if there is a difference, and if so, what distinguishes these two very similar sinks? There isn't really a difference, they are pretty much the same thing, unless you really want to be picky about it. 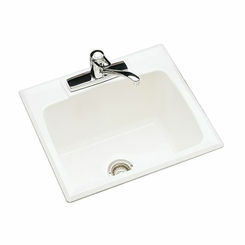 The laundry room sink is not always in the laundry room, so what else differentiates it from a utility sink? 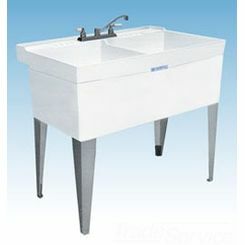 Probably the most distinguishing characteristic is that laundry sinks are typically smaller, which means they can both be used for the same purposes as long as the basin size doesn't matter. 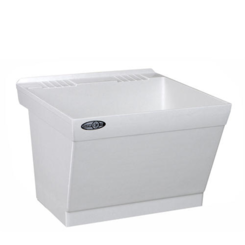 Most use the laundry sink for hand-washing clothes. 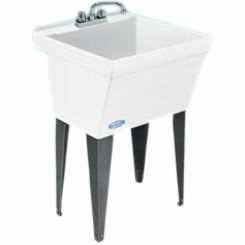 If you have kids or pets, then a laundry sink can make your life a lot easier. 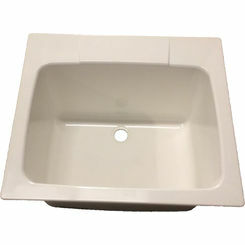 With many different and unique styles, there is no doubt that one of our sinks will match the décor of your home. 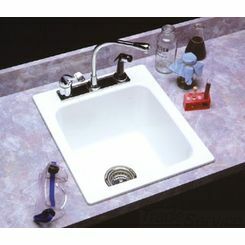 Browse through our large selection of discount laundry faucets. If you have any questions about any of our models or installation, please contact one of our professional associates.  We have partnered with trusted manufacturers, and that includes Elkay, Kohler, American Standard, Swanstone and many more. Each one of these units is unique and helpful especially when it comes to keeping dirt and mud out of your home.